We always welcome articles and photos for the newsletters. On behalf of The Board of Directors of The Friends of Hall’s Pond, we want to welcome all who use Hall’s Pond Nature Sanctuary, to thank our wonderful very special Volunteers, and note our appreciation to the Brookline Conservation Commission Commissioners and to their staff, Tom Brady and Heather Charles for their untiring efforts on behalf of this unique Brookline resource. We are proud to be your partners in the protection and preservation of Hall’s Pond. At the spring 2009 community work day, the Friends of Hall’s Pond undertook the planting of shrubs and trees, in one of the largest planting efforts since the renovation of the sanctuary completed in 2002. Included among these plants were Atlantic white cedars, once one of the dominant species in the original wetland but absent from Hall’s Pond for many years. The return of cedars to Hall’s Pond is another step forward, led by the Friends, in improving the quality and diversity of the sanctuary habitat. WHEN YOU’RE BROWSING through the Sanctuary over Spring and Summer, some of its avian denizens are obvious by their large size or busy activity. On the open water are the nesting Canada Geese and Mallards. 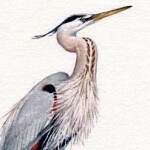 The 4-foot Great Blue Heron is our hoary mascot, the ‘old man of the pond.’ On the Beacon Street side, a gaggle of House ‘Sparrows’ (really émigré weaver finches) chirpily greet you. Hues and Rustles Winter’s nearly upon us, so it’s time to roll up the boardwalk until spring. Or is it? Winter’s bark is worse than its bite, and far softer than the baleful baying of the weather reporters of the everbleak outlook. So, get out and enjoy the winter, whatever the weather. Lord knows our feathered friends always make the best of it with good cheer. Birds and small mammals forage avidly in the snow, and Hall’s Pond usually enjoys lively wildlife from November through March. WINTER BIRDWATCHING in New England is exceptionally exciting, my favorite season, after Spring. Birds come right to your feeders, show themselves easily in bare woods. Ocean and lake ducks fly down from Canada in vast numbers; you can scope or binoc them, or eyeball some (Mergansers, Canvasbacks, Scaup, Ring-necks, Ruddies) at Hall’s Pond or Fresh Pond in Cambridge. THE TOWN of Brookline has budgeted $300,000 to be spent by the Park and Recreation Commission for improvements to Amory Park. Larson Associates, a landscape architect firm and the Town’s design consultant has had multiple informative public design review meetings over the past few months, including site visits. Hall’s Pond Sanctuary and the adjacent neighborhood, Cottage Farm, are part of the National Register of Historic Places (1978) and the first local (Brookline) historic district (1979). The Sanctuary, located behind 1120 Beacon Street, is administered by the Conservation Commission with financial and maintenance support by the Friends of Hall’s Pond. The Friends group has been a model for more than a dozen subsequent “ friends” organizations in the Town which support a variety of neighborhood sanctuaries, parks, gardens, woods, and playgrounds. An extensive restoration of the Sanctuary was completed in 2002, at which time Hall’s Pond (3.5 acres) was combined with the adjacent Amory Woods parcel (1.6 acres). This is the first of a series of historic vignettes relating to Hall’s Pond Sanctuary and the neighborhood surrounding it, Cottage Farm. Hall’s Pond is one of two natural ponds remaining in Brookline. Purchased by the Town in 1975, Hall’s Pond is historically significant for having been owned by Minna Hall, a co-founder of the Massachusetts Audubon Society in 1896. The Hall’s Pond area has long been valued in Brookline for its open space qualities.